Liz Veazey (liz@weown.it) has been a social change leader for 15 years and has been with We Own It since its first Launch Team meeting in 2015. 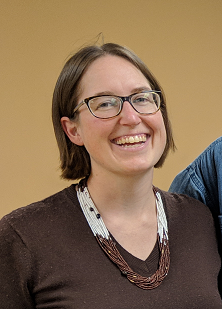 She co-founded the Energy Action Coalition (now Powershift Network) in 2004, founded and directed the Southern Energy Network from 2006-09, was Treasurer for the Highlander Center Board of Directors from 2009-14, and has been a member of Mode Shift Omaha’s Board of Directors since 2014 and RE-AMP's steering committee since 2017. Liz has a MS in Environmental Studies, a BS in Environmental Science, and received the Morris K. Udall Scholarship for Excellence in Environmental Policy and Leadership in 2002 and 2003. She has been a member of many cooperatives including a credit union she joined as a child growing up in North Carolina. She currently lives in Omaha, Nebraska.